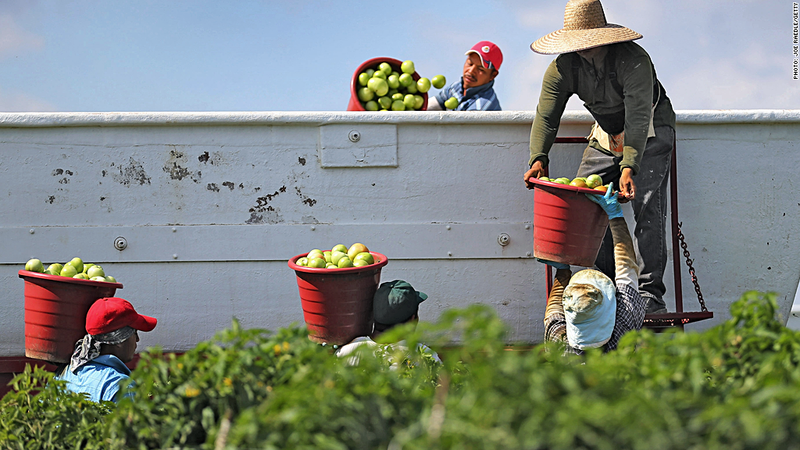 The tomato industry in Florida has faced allegations of grave human rights abuses in the past two decades. Wal-Mart announced a partnership Thursday with a workers' rights group in Florida in an effort to boost pay and labor standards in the tomato-growing industry. The Coalition of Immokalee Workers said Wal-Mart (WMT) has signed on to "strengthen and expand" its Fair Food Program, which consists of a commitment from corporate buyers to pay an additional penny per pound of tomatoes that then gets passed on to workers. There is also a human rights code of conduct that deals with safety, dispute resolution and other issues. Greg Asbed, co-founder of the Immokalee coalition, estimates that 30,000 Florida workers will benefit directly from the agreement through higher pay or increased support for the Fair Food Program's code of conduct at the farms where they work. Current pay for tomato picking varies among growers, but is around 50 cents per 32-pound bucket of tomatoes, Asbed said. "We are truly pleased to welcome Wal-Mart into the Fair Food Program," said the coalition's Gerardo Reyes. "No other company has the market strength and consumer reach that Wal-Mart has." As part of the partnership, Wal-Mart says it will work to expand the Fair Food Program to other crops besides tomatoes. The retailer will also "[r]eward those Florida tomato suppliers whose operations best reflect the principles of the Fair Food Program with longer-term purchase commitments." All suppliers will be subject to audits. "Wal-Mart believes that leading on social issues is a good business practice and helps ensure our customers have access to high quality, fresh Florida field tomatoes," spokesman Kory Lundberg said in an email. "Our commitment to the Fair Food Program can also help improve the long term sustainability and viability of the produce supply chain." Florida's tomato industry has faced allegations of grave worker abuse over the past few decades, but the Fair Food Program has won praise in recent years from the White House and others for its success in promoting labor rights. Alexandra Guáqueta, chair of the United Nations Working Group on Business and Human Rights, said the FPP uses a "smart mix" of tools to promote worker rights and better living standards. "Workers are consulted, they lead on peer education on human rights, and existing U.S. labor laws are upheld," she said in a statement Thursday. Wal-Mart doesn't usually get good press on labor issues. The company is a favorite target of activists, and was hit with a complaint this week from federal officials alleging that it illegally retaliated against workers who staged Black Friday protests in 2012. "Farm workers harvesting food for Wal-Mart will no doubt benefit from the increase in wages that will result from the company signing onto the Coalition for Immokalee Workers' Fair Food Program," Martha Sellers of OUR Walmart, a union-backed advocacy group, said in a statement. "But the company must continue to improve wages and jobs for all of the workers that help Wal-Mart profit."